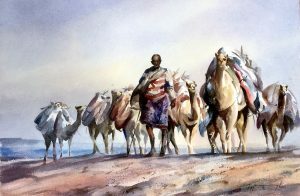 Forward facing nomadic figure and camels, being led over new desert terrain. Beautiful coloured washes illuminate this atmospheric piece by Trevor. The blue to yellow colourations are dominant in this work. 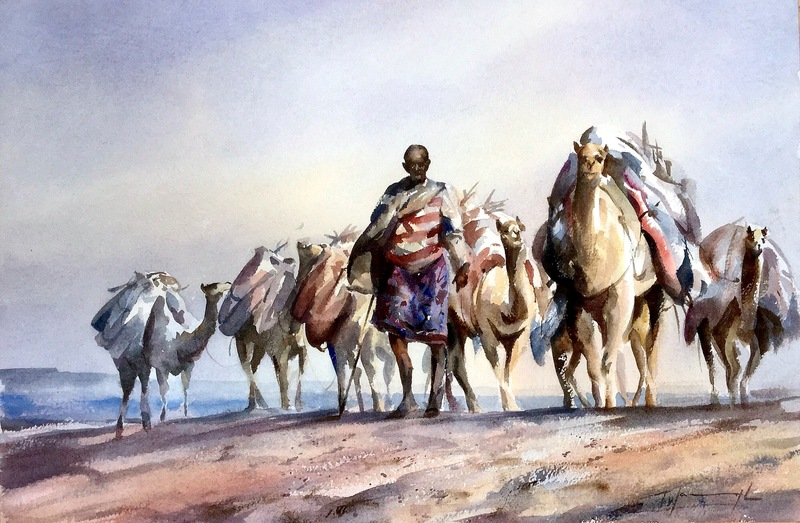 The soft wet-into-wet washes in the sky contrast with the dark harder colours in the figure and the camels. Trevor has seen the caravan in curved perspective as they traverse a shallow dune to appear on its apex before decending. The dark elongated shadows suggest late evening lighting and there is a sense of urgency in the movement to make camp before the day comes to a close.